When shopping for a leash or lead for your dog, one of the styles that often comes to mind is the retractable dog leash—a cable attached to a plastic handle that fits into your hand. The idea behind the retractable pet leash is quite popular, but is this style of dog lead right for you and your pooch? Aside from looking at some of the best retractable dog leashes on the market, we are also going to introduce some pros and cons of their use. **Below, you can read more of our detailed reviews for each above ﻿of the Best Retractable Leash﻿. You may also﻿ click the links above to read customer reviews and see the current prices on Amazon. 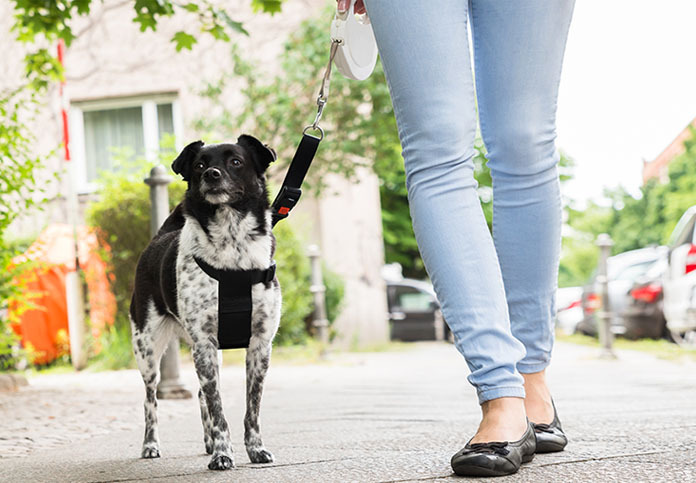 As mentioned earlier, the retractable leash is nothing more than a thin length of cord that wraps around a spring-loaded device within a plastic casing. There is a button on the handle that you hold which controls exactly how much cord is extended (or how far your dog can go without you walking within him). Usually, the distance you can grant your dog is anywhere from 16-26 feet. Obviously, control of the leash itself is relatively easy, since all you have to do is push the button to either extend or reel in the cord. How many dogs you are trying to manage at one time – having two dogs on a retractable leash is not a good idea. You can read more on this in the pros and cons section. ● The allowable space between you and your dog. This leash has been popular for some time now because of its sturdy, high-quality material with reliable brake and lock features. Your dog will enjoy the length of 23 feet, and you will like the sturdiness of both the handle and the polyester cord. The rubber handle is easy to grip. You get extra security from the quality of the retracting mechanism, which is highly resistant to damage. You can choose from two colors - black or white. So you know how we were talking about retractable leashes not usually being reflective? Well, this one is. The cord is made with patented "high neon reflective technology," making it a great tool for nighttime strolls around the backyard. You can also choose between two length options: 16 feet or 20 feet. The leash has also won the San Francisco Pet Association's Pet Safety Award for 3 years in a row. Hook to hold filled poo bag. Some people want to let their big dogs, like the Great Pyrenees or Anatolian Shepherd, for example, to enjoy the benefits of the retractable dog leash without getting yanked from 26 feet away. Enter the Flexi Giant tape leash that has absolutely no weight limit. "Tape" refers to the ribbon-like design of the leash. The leash is incredibly sturdy and has a breadth of features that make handling your large or extra-large sized dog easier than ever before. Flexi retractable dog leash are made in Germany and come with a 2-year manufacturer warranty. Another example of "tape" or "ribbon" dog leash instead of a cord. This leash extends up to 16 feet and allows you to remain in complete control of your dog thanks to the 1-Touch locking and unlocking system. Retraction can be done in an instant. Though the leash has a weight limit of up to 110 lbs, it is recommended for small or medium sized dogs with loads of energy. The Triton leash comes with one of the longest warranties on the market: a lifetime replacement guarantee, which gives you confidence in the durability. Heavy duty means that even against pulling and chewing, this leash will hold up quite well. The nylon ribbon leash extends up to 16 feet to give your dog the freedom he wants. However, you will remain in control with the Brake and Lock button that keeps the leash tight as long as you keep your finger on the button (however, this may be difficult with people that have weak fingers or low grip strength). This retractable dog leash has long been at the front of the pack, so to speak. The reason is the "tangle free" line that allows for one-handed control. Plus, the "release and recoil" system lets you retract and rein in an unruly dog with ease. The nylon tape extends up to 16 feet smoothly for dogs up to 110 lbs. The best part about the TaoTronics leash is the "weather proof" guarantee, meaning in heat and freezing cold, the leash will not malfunction. Release and Break function that gently retracts and remains at a specific length, even when the dog is pulling. As with all devices, there are advantages and disadvantages in using a retractable dog leash. Ideally, you want to consider the questions as mentioned earlier as well as the following information to make the decision of whether or not this kind of leash system is appropriate for you and your dog. The distance allows dogs to be dogs and enjoying having their nose to the ground. Plus, you don't have to be right next to them as they do their doggy "duty." The length of the leash is less restrictive than the traditional 4 to 6-foot long leash. Extra length and distance means the people with handicaps can have better control over their service pet or send the service dog across greater distances to complete tasks. Retractable leashes less commonly get trapped in wheelchair tires, as well. Small dogs are less likely to get tangled up in a retractable leash. Retractable leashes are perfect for playing fetch and teaching recall, especially for dogs that have a tendency to bolt and frolic when unsnapped from their leash. Ideal for medium and large-sized dogs who are already trained and have excellent responsiveness. Though letting your dog get up to 26 feet away sounds great, when something dangerous happens, like the dog running into the street or getting attacked, you're that much farther away. Since the lines are thin and non-reflective, bikers and pedestrians may not see the cord and will trip over it. Retractable leash train your dog to pull because pulling extends the lead. The thin cord can break, especially with larger breeds. Not suitable for hyper, fearful, or poorly behaved dogs. Getting wound up in the cord while it's getting yanked or pulled can result in severe injuries to both human and dog, including burns, breaks, cuts, road rash, and even amputation. Retractable leashes wear out faster than other types and may either unspool randomly or get stuck either on retracting or extending. There you have it - a rundown of some of the best retractable dog leashes on the market for you to choose from. Have you used any of the dog leads listed here? Which one are you most likely to consider purchasing for your dog? We would love to hear your thoughts and experiences dealing with retractable dog leashes in the comment section below. DogsHealthBlog.com is a participant in the Amazon Services LLC Associates Program, an affiliate advertising program designed to provide a means for sites to earn advertising fees by advertising and linking to Amazon.com and any other website that maybe affiliated with Amazon Services LLC Associates Program.